Levenger's True Writer Select Fountain Pen | Inkdependence! I contacted Levenger a little while ago, and I was really excited when they offered to send one of these pens out for review. I think their ink was one of the first that I'd ever used, but I've never gotten to use one of their pens before. 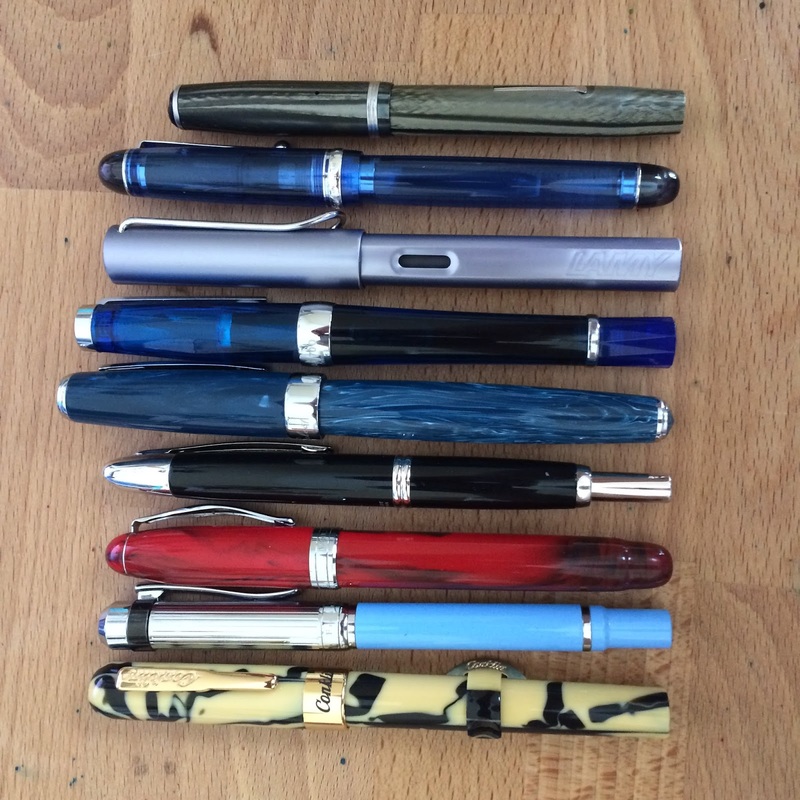 I've heard good things about the L-Tech, but I haven't really heard much about their other pens (aside from the L-Tech, which gets consistently positive reviews). After using this one, I'm thinking that I'll try out another soon. It starts with a cardboard sleeve. Then there's a classy cardboard box with "Levenger" pressed in silver on the lid. THEN the side of the cardboard box folds down and there's a fabric liner inside which reveals a black, solid-wood box with some blonde wood trim. The inside is the typical velvet affair. The only problem is that the little platform with the pen ribbon isn't suspended, so there's no place to store ink cartridges or anything underneath the platform. It's not necessary to have that in there, I guess,but it would have been nice. I usually stick the box in a cabinet, but this is one that I'm going to keep out on my desk. So good. It's awesome. I've got a lot of pens, and this one ranks in the top of the factory-nibs I've ever used. It's smooth, but it doesn't skate around the page or skip as too-smooth nibs sometimes do. It's got a perfect flow that needs no adjustment. It's honestly a joy to use. The medium line is on the finer side of the spectrum, but that's okay with me. You can get other nibs on the Levenger site for $30 a pop. Some expensive pens end up feeling really cheap in the hand, but this isn't one of them. The resin is solid and thick enough that there's not even the hint of flex or rattle in the pen. 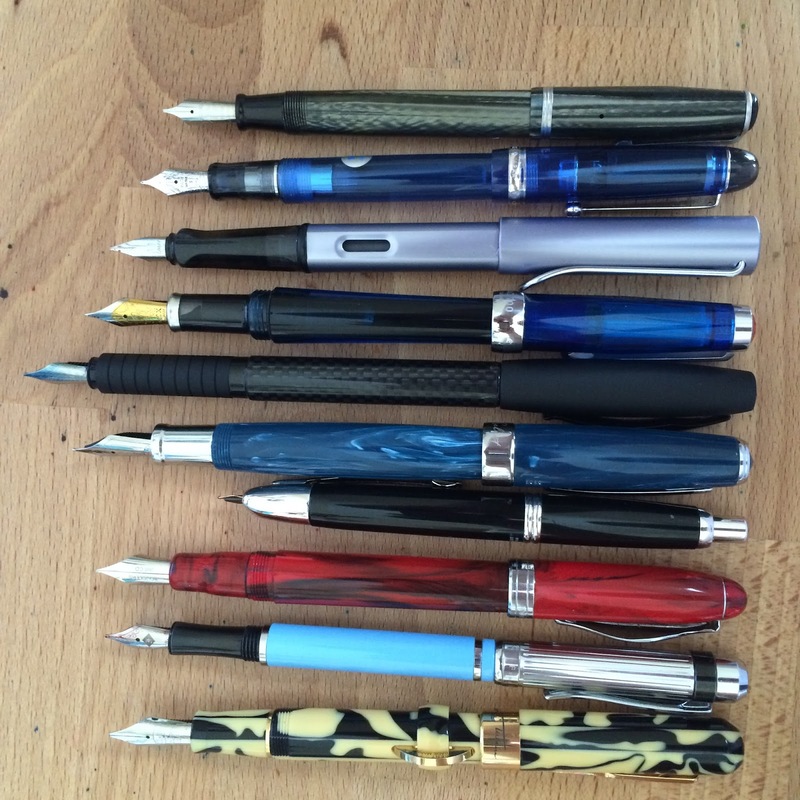 The closest pen, in length, is the TWSBI Vac 700. It's just about exactly the same length. I added in the Faber-Castell Basic to the bottom picture. It's the longest pen that I own, but I didn't think of it until I made the video for this review. The True Writer Select is a long pen (posted), but it has nothing on the Basic. I don't feel like I can give a recommendation about buying this pen. It's on the expensive end of the spectrum, and I didn't pay for it. Some won't like paying this much for a steel nib, but this pen is better than my Pilot Custom 74, and it's in the same price range. This nib came tuned better from the factory, and it's piston converter is less silly than the CON-70 that ships with the Pilots. It also feels more substantial in the hand. I suppose what I'm saying is that if you have the choice between them, I'd go for the Levenger True Writer Select. Find this pen in two other resin designs on Levenger's website.